The Well Living House is an action research centre that is focused on Indigenous* infant, child and family health and well-being. At its heart is an aspiration to be a place where Indigenous people can come together to gather, understand, link and share best knowledge about happy and healthy child, family and community living. Be a place of refuge and renewal for Indigenous infants, children and families. Build on similarities and synergies between Indigenous and western science. Put Indigenous knowledge at the foundation of health services and programs for Indigenous peoples. 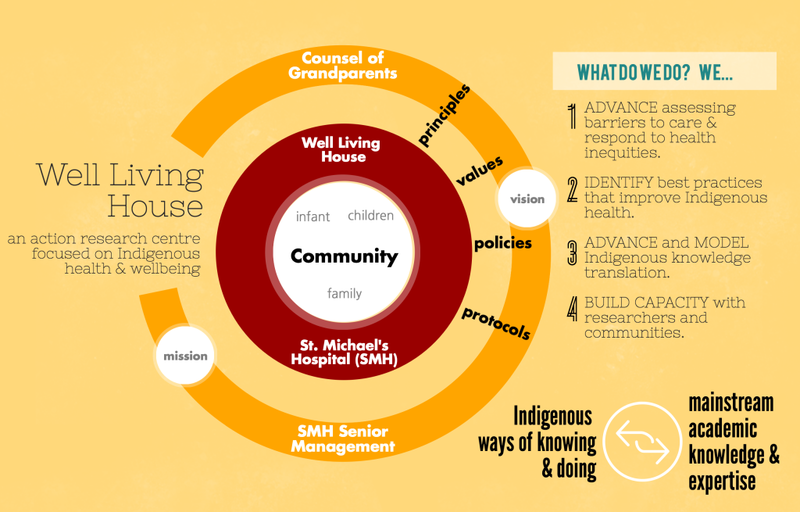 The long-term vision of the Well Living House is that every Indigenous infant will be born into a context that promotes health and well-being — at the individual, family and community levels. We plan to achieve this vision by improving health policies, services and programs through knowledge work: conducting research, building knowledge networks and providing training. The centre is built from a foundation of almost two decades of collaborative work between Indigenous health researchers, front line health practitioners and Indigenous community grandparents. In all that we do, the Well Living House is committed to using and protecting our Indigenous knowledge, languages and ways of working. The Well Living House is housed at the Centre for Research on Inner City Health (CRICH), part of St. Michael’s Hospital in Toronto. A committee of Elders, the Counsel of Grandparents**, has been struck to guide the establishment and operation of the Well Living House. * We use the term ‘Indigenous’ to be inclusive of all people who self-identify as Aboriginal, First Nations, Indian, Indigenous, Inuit and/or Métis in Canada, as well as global Indigenous peoples. ** To underline our commitment to action, the Grandparents use the word ‘Counsel’ (verb) to describe themselves, rather than ‘Council’ (noun).